While visits to Granada, Alhambra, Cordoba and Sevilla are a must when traveling in southern Spain, our decision to spend three days exploring the hill towns of the Andalucía Mountains left us with a memorable experience that exceeded expectations at all levels. 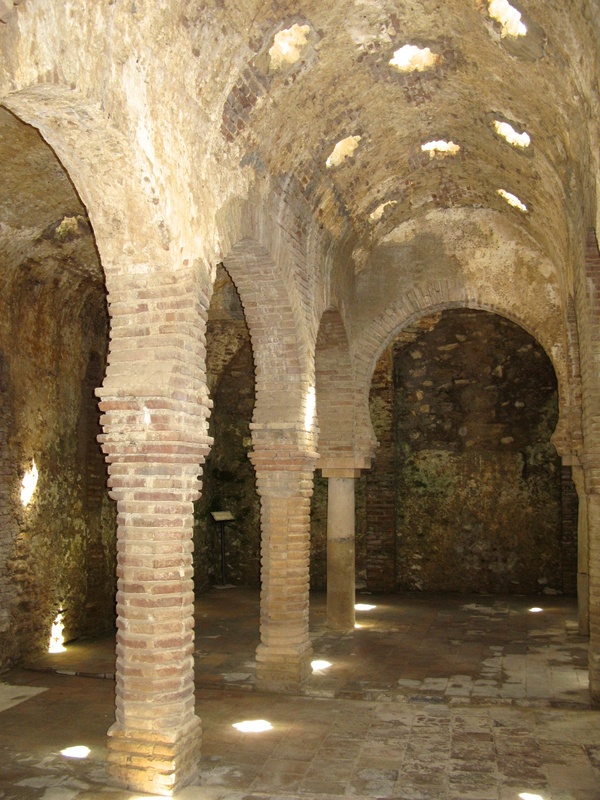 Our image of old Spain is, in many regards, based in Andalucía. 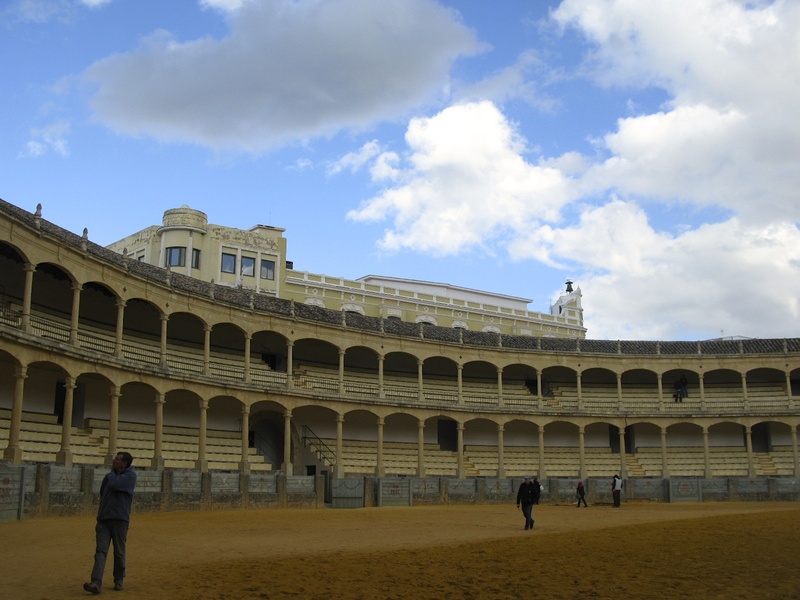 It is the home of bullfights, flamenco, gazpacho and unbelievable landscapes. With the larger cities of southern Spain on the horizon, our focus for the next few days was Ronda and the other pure, picturesque whitewashed hill towns, each sustaining their own unique village lifestyle. Learning a few days earlier that the Ronda Avis office had closed, thus terminating our reservation, we were able, through the help of a hotel clerk in Madrid, to secure an early 21st Century “Ford something” from a local entrepreneur. 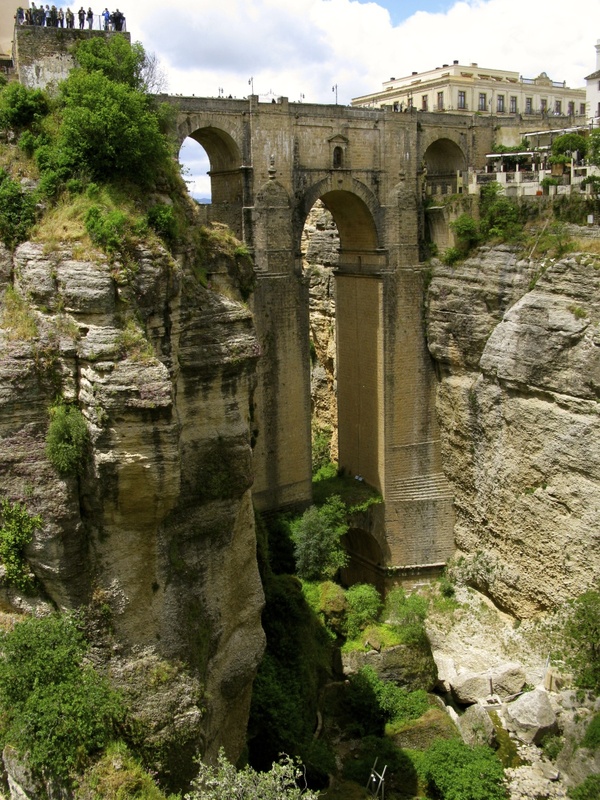 We arrived by train in Ronda, which was intended just to be our headquarters for daily excursions to the hill towns. Rain required a taxicab straight to our hotel, but our desire to walk and to see some of the town before dusk led us back out, requiring an umbrella and rain coats. While on this walk we soon discovered that Ronda was not only our base, but also the largest and most spectacular hill town of them all. Directed to Plaza se Espana and the New Bridge, built in 1751, which leads to the entrance of Old Town, we first passed by Spain’s first great bullring, dating back to the 16th Century. 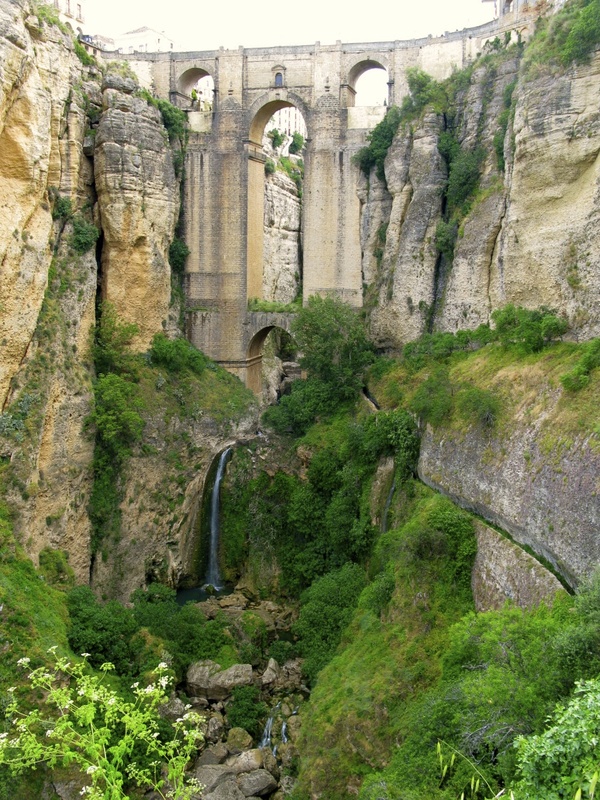 Then, as we approached the “Puente Nuevo,” the deep gorge they call “El Tajo” came into view. A ravine, nearly 400 feet deep and 200 feet wide that divides the old Moorish area, La Cuidad, from the new town (cir. 1485) “El Tajo” is spectacular enough with majestic rock formations, natural landscapes and buildings perched at the base of its cliffs, but the view of the bridge, reaching deep into the canyon amid wildflowers and waterfalls was as spectacular as any span I had ever seen. This first visit was a stunning preview to Ronda and sparked our desire to hike down the Jardines de Cuenca Park trail for the best views. However, we had a car reserved for the next morning and the hike would have to wait until we had explored the other white hill towns. 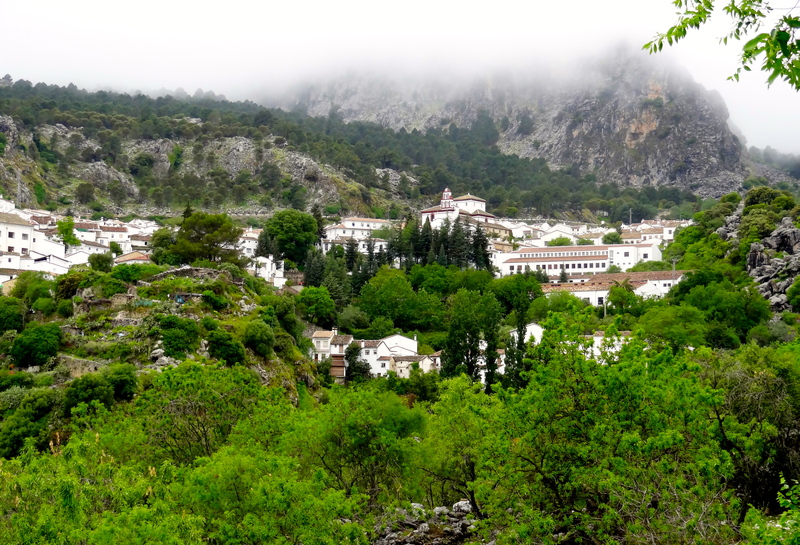 Amid a steady rain, we received our car and were soon driving among olive groves, then cork forests in the Sierra de Grazalema Natural Park before the winding incline that assured us we were on our way to Grazalema, the first white hill town. 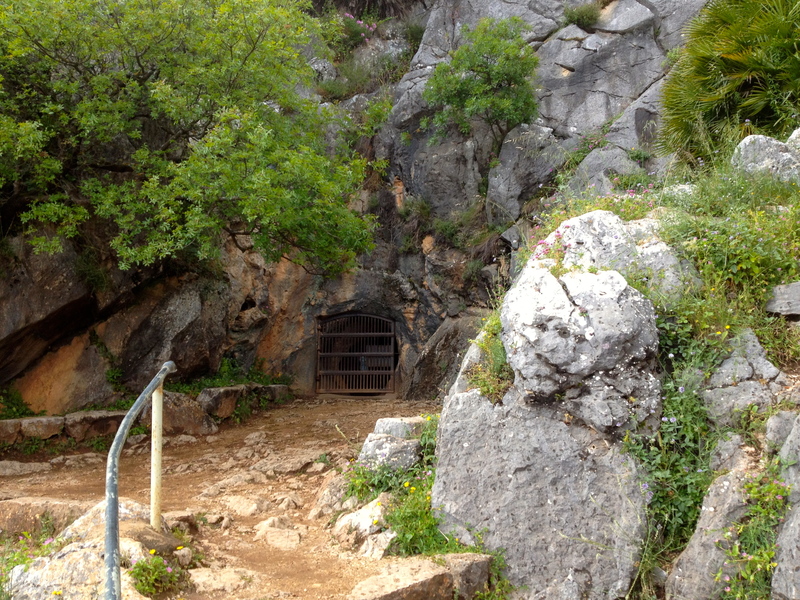 Grazalema, Zahara and the Pileta Cave, three stops on our visit, are all located within the park. outcroppings. Whitewashed buildings, red roofs and window flower boxes spilling over with bright flowers line the narrow streets that all lead to a small public square, which was fairly empty on a rainy Sunday morning. 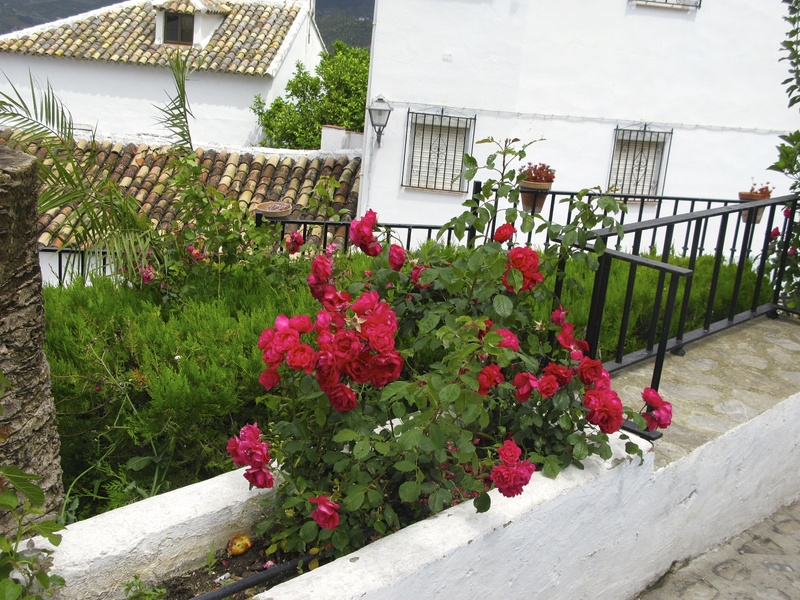 With quaint shops and remarkable views, Grazalema is a popular base for Spaniards who hike in the natural park. Driving over the steep Cadiz Mountain pass to Zahara was my most “white-knuckled” in memory. Twisting, slick roads at high altitude, with no protective barriers, in a strange car with manual transmission all shared responsibility for the increase in my heart rate. 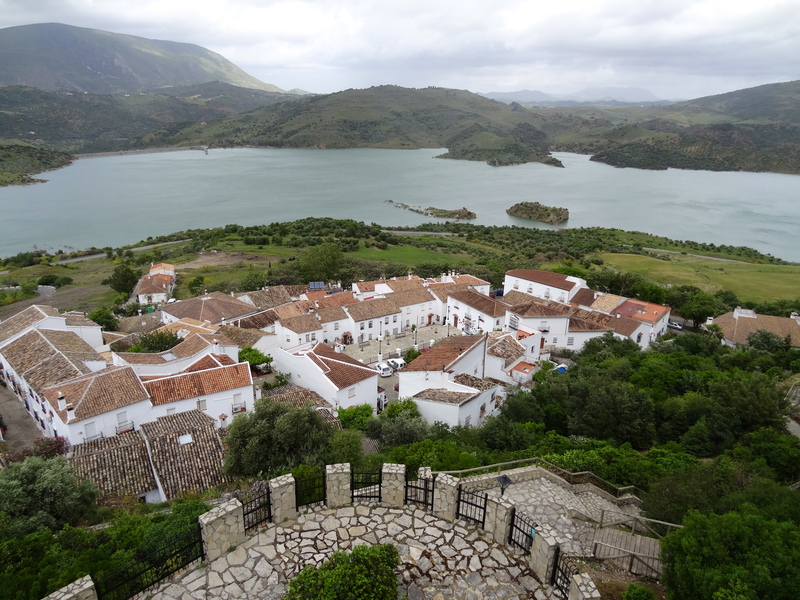 We did find respite at the summit with the large mountainous saddle rendering views of the Zahara Reservoir. More winding roads lie ahead as we began our dissent down the mountain toward the second village. Zahara spreads out below an old fortified Moorish castle that once constituted its boundaries. 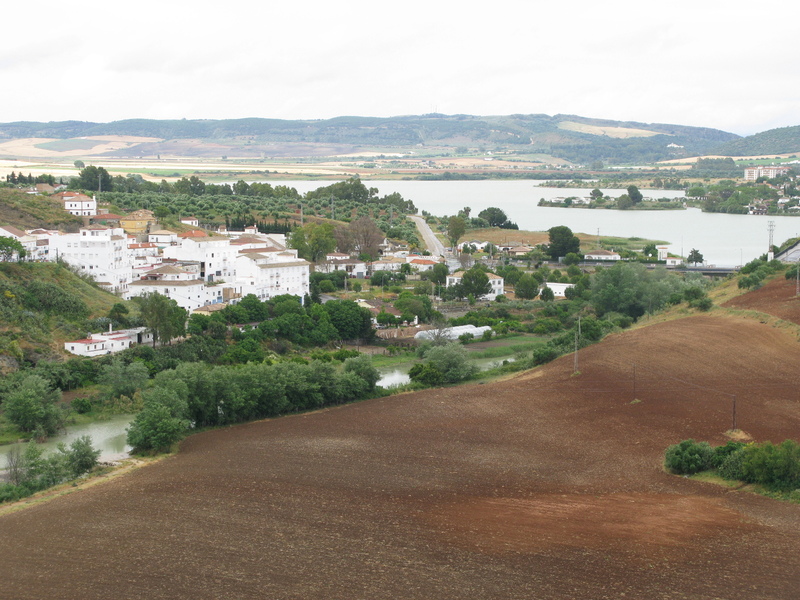 Once a stronghold for the Moors, Zahara played a significant role in the Reconquista in 1482. 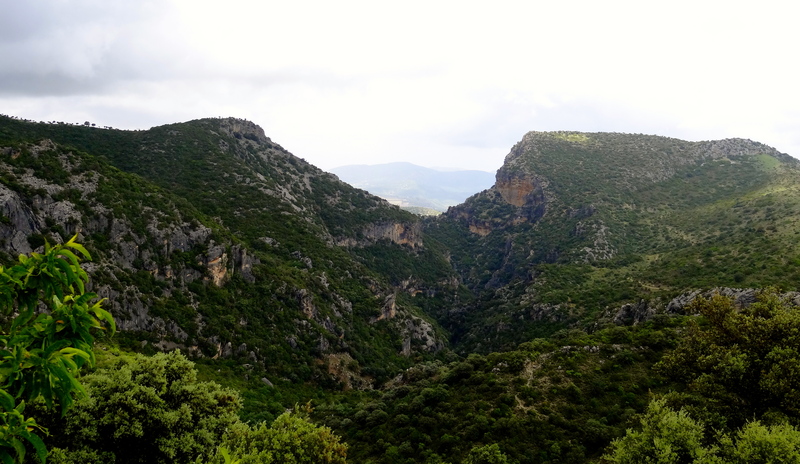 The hike from the village up to the castle is good exercise and renders some impressive views of the region. buildings, finding interesting shops and numerous vista points. In a small church off the town square sits the Virgin of Dolores, an iconic statute that is celebrated throughout the year. Reservoir turnout is recommended for great panoramic views of the town. Route A-374 soon turns into A-384 and we are on our way to Arcos de la Frontera, our final white hill town stop of the day. 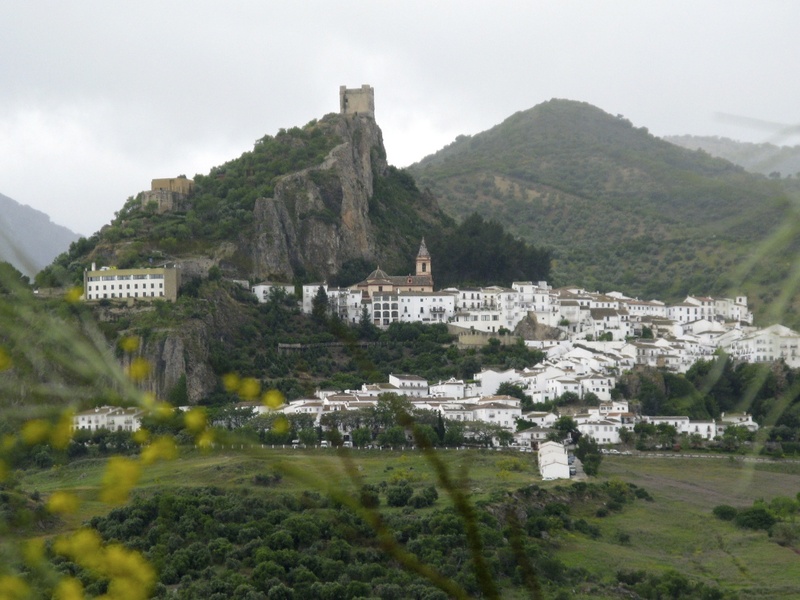 The old town of Arcos narrowly spreads itself across the hillside cliffs, seemingly a totally different place than the lower village. For me, the best part of Arcos is the views of old town shimmering in the late afternoon sun. Plaza del Cabildo, the center of old town is bookended by the Church of Santa Maria and the parador, a former governor’s palace. After a surprisingly nice dinner in old town, we drove back to Ronda, anxious to explore our local environs more thoroughly. photos of Ernest Hemmingway who was a part-time resident here. The picturesque arena, perched on the cliffs was intriguing, but the canyon spoke to us. As we entered the trail down into the canyon, the breathtaking views of the bridge, cliff-top buildings, waterfalls and the surrounding flora continued to change the deeper we descended. Dozens of photographs later, we ascended the trail back to old town and began to explore the ancient La Cuidad area, including the remnants of early Arab cultures. 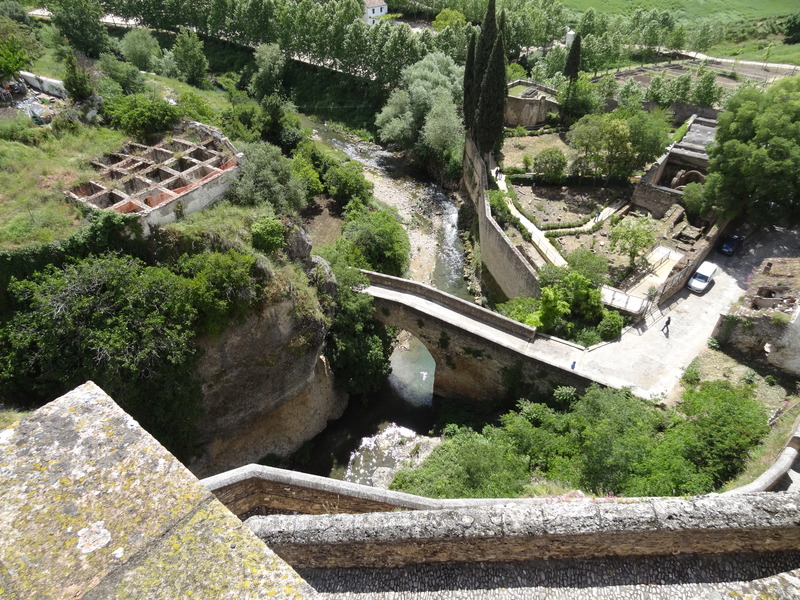 Up from the gorge, we traversed through the Moorish Quarter and its amazing history, walking toward “El Tajo,” moving down past the Old Bridge, which was built around 1616, and an old city wall to the Arab Bridge, marking the ancient entrance to Ronda. A short distance past the Arab Bridge lies the remains of the Arab Baths whose location was not an accident. After a long journey, the baths provided the necessary place to cleans one’s body before prayer. Our ascension back up the opposite side of the canyon to Plaza de Espana left us with many scenic views and an appetite. We found a restaurant perched on the canyon wall and settled into a relaxing lunch with more breathtaking views. During lunch my wife informed me that we had to be at the entrance of Pileta Cave by 4pm. What and where, I inquired. Spain’s best opportunity to view Neolithic and Paleolithic paintings, some dating back 25,000 years. Soon, we were back in our car, driving past cork and olives toward the small town of Benaojan, a benchmark on the way to the cave. Descending into a cave is never really pleasant, it’s deep, dark, damp, and slippery and, as a designated lantern carrier, I felt responsible for the six people between the next lantern and me. However, the rewards were astonishing and sometimes hard to comprehend. This is prehistoric finger-painting at its best with many definitive drawings of horses, cattle and, uniquely, a large fish. of the Andalucía surpassed all of our expectations and became one of the most memorable stops during our month in Spain. 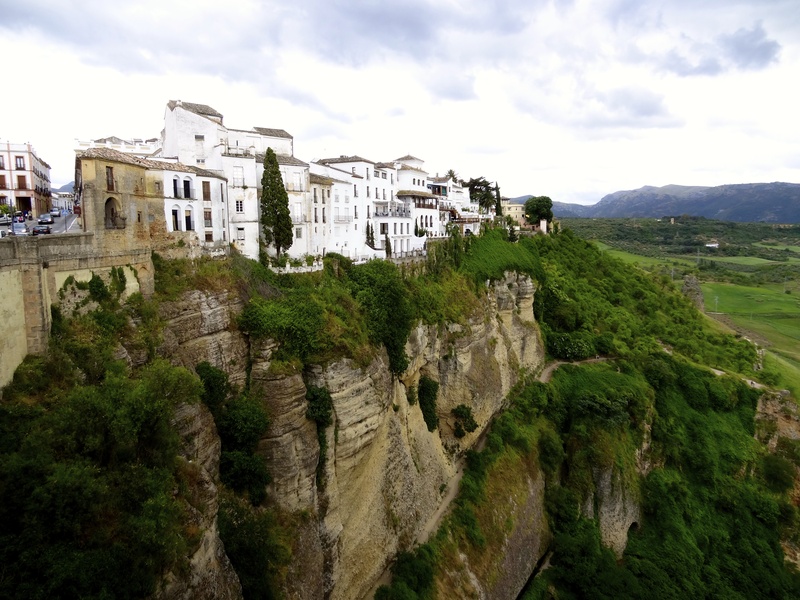 The next morning we were on a train headed to Cordoba and Sevilla with the conviction that we would one day return to Ronda to further explore the area and relax in the atmosphere of true Spanish hospitality. 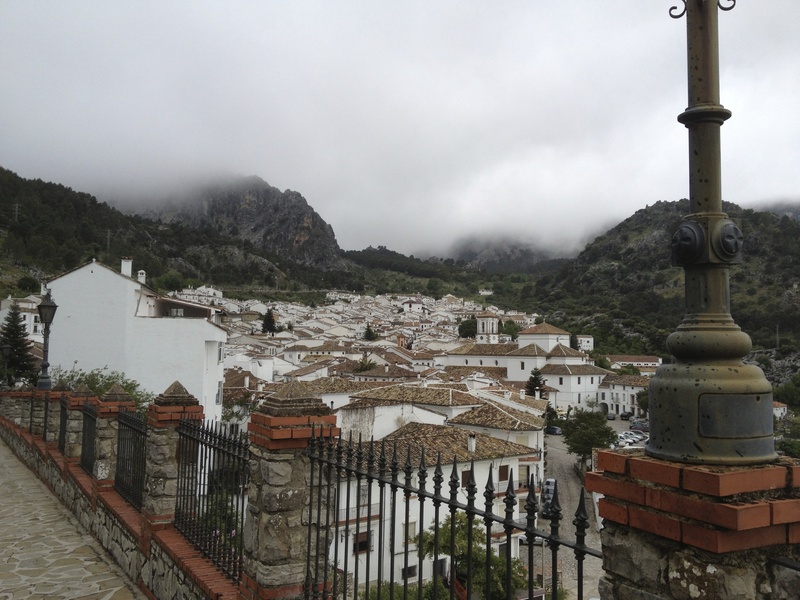 This entry was posted on Thursday, December 5th, 2013 at 12:21 am	and tagged with "El Tajo", Arcos, Grazalema, Ronda, Zahara and posted in Travel. You can follow any responses to this entry through the RSS 2.0 feed.